"It began with the forging of the Great Stimulus. Three billion was given to the Insurance wizards, immortal, wisest and fairest of all beings. Seven to the auto manufacturers, great builders and craftsmen of Detroit. And nine, nine billion was gifted to the bankers, who above all else desired power. For within these billions was bound the strength and the will to govern each race. But they were all of them deceived for another bill was made. 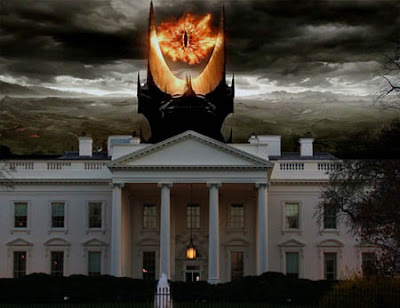 In the land of D.C. in the heat of the Oval Office, the Dark Lord Czaron forged in secret a master bill to control all others....."